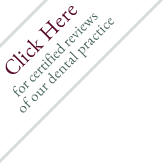 We are pleased to offer Invisalign®, a state-of-the-art service to our patients. The technology allows us to create beautiful smiles without the embarrassing and cumbersome metal braces of the past. Your teeth are laser-scanned into a computer where Cadcam technology creates a series of clear removable custom-made Aligners. Wear each set of customized Aligners for about two weeks. Remove only when eating, drinking, brushing, and flossing. Visit your doctor approximately every six weeks. Your teeth will begin to shift gradually between these dental appointments.